I present http://gametactic.org/squad, an interactive/collaborative map planning tool for Squad. Invite other people into your room by giving them the link. Start planning using the tools to the right. Now that I have your attention. Consider the available icons as placeholders for now. I'd like to know from yoyu which icons would be useful for Squad specifically ? I like this collaborative map thing! Nice job! Great stuff, man! I'll be sure to use this going forward. As for icons, if you were able to implement the same map-markers available to squad leaders that would be really neat. That's sort of deliberate. If you zoom in x5 and icons would stay the same size, they would fill half your screen, which feels awkward. So icon sizes are relative to the view port. With the trade off that the size meter is not an absolute value, which also feels awkward. Not sure what the right solution is here. You can always re-scale them using the select tool and making the select box larger or smaller though. When placing icons, they appear centered on your cursor. But you can quickly adjust their position by dragging them. Yes that's probably what I'm looking for. Basically I'm looking for an image with those icons neatly lines up, I haven't really found that. I haven't actually played the game, so I'm not even sure exactly what they look like. @Kalith, it is possible to extract the in-game map images from the asset files using a UE tool (can't remember on a whim what it's called). If I'm not mistaken, the same should be possible with the map-markers. TomNedry's thread on Hi-res maps should have a link to that tool. Of course, a workaround is to print screens of each marker while in-game and then edit and clean them with a photo program. Though I reckon that is quite time consuming. I got the maps from TomNedry's website. If someone has them without the grid, then I can make toggle grid on/off, like the wot version of the website. But overall the maps look very good, my thanks to OWI and TomNerdry for making them available. It's very possible the markers are somewhere in the game files. I've looked through my share of game files for the other games with varying degrees of success. I don't actually have a copy of the game though as I don't really have gpu that can run it. I've looked around on google a bit, but the closest I found was http://forums.joinsquad.com/topic/236-squad-icons/. It would be nice if someone could check if the map markers are available in the game files somewhere, or maybe one of the devs could give me a link. If not, a screenshot would be nice, so I have something to start from. And also these markers keep changing in every update maybe u can get them from somewhere.. I can look around in the game files for you when I get the time, otherwise I'd be happy to assist you with screenshots. That would be excellent, thanks. I know this might be a little extreme but image if you had a tablet (or you could use your mobile device) to view this map in real time! Awesome work! I guess the like button has been removed from the forums. So I rated the topic. Excellent idea. @Z-trooperit would be nice to have this in game. 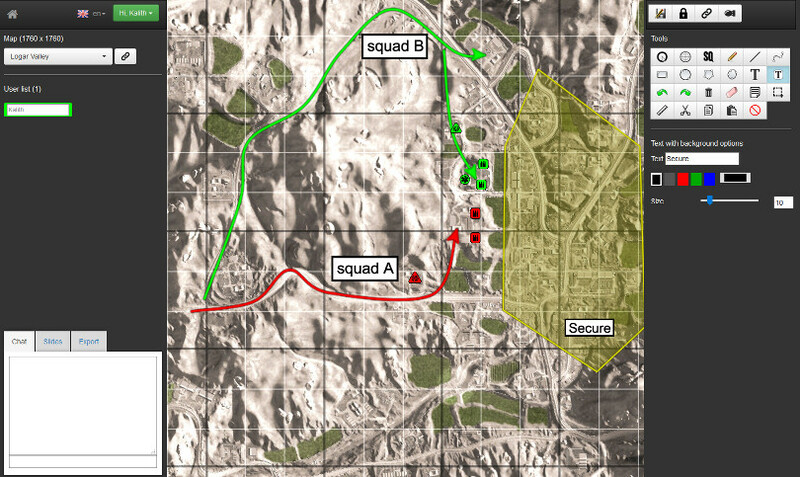 Where SLs who are in close proximity to each other can draw on the map like this, and then squad members who are in close proximity to their own SL can update their maps. While you are working on your map your view should be entirely obstructed by the map. SLs would have to rendezvous in safe locations to adapt plans. I can see how this could diminish voice comms but I think it adds enough functionality and realism to be worth it. It would also be better to have this function in-game where it can be balanced than just having a map open on another monitor which anyone and everyone can use which would break realism and could drastically diminish voice comms. To view this map in real time on your tablet/cell phone all you have to do is to just open http://gametactic.org/squad on your tabled/cell phone. Nah, man. This feature can and will only be beneficial to top-end clans which play together a lot on pubs and play a lot of clan-wars and events. If they will add this map to the game, people will just draw some mad strategies(they kinda do it even now) which never work. This planner would also make squad leaders to waste too many time on planning. If they added a proper commander to the game, then yes, it would be nice to give a commander this kind of a planner. The icons are a placeholder, I plan to put a set of icons similar to the in game icons in. It would help a lot if someone could a) give me a link to the icon files itself or at least make a list and screenshot of the icons you want to see. You can already rotate icons: select tool -> select -> drag rotate arrows. You can plan phases using slides, bottom left, second tab. There was a small problem while drawing things zoomed in, it should be fixed now. I was actually recently working on a world of tanks mod that inputs info from the client into the planner. It works quite well, but implementing something like this does require mod and/or dev support. I also quickly realized that gathering info from different clients live onto a map can quickly become an unfair advantage and may not be what the devs intended. Right now the website is used quite a lot (7-10k daily users) by the world of tanks community. And it's indeed mostly used for clan-wars and team battles. So organized play, mostly with voice comms. Even then there is a reason that rooms start out locked (only creater can edit), until you unlock it give specific people edit rights. Perhaps you don't know but Squad is being designed for advanced public play. Where you can play with pub players the same way the top clans of other games play. Yes people will do well and do not so well.... that's the way it goes. Squad leaders, in general, do not take enough time planning now. Players are too excited to get shooting and the Squad Leaders just give in. Play with a SL who is taking his time and you'll never want to go back to the guys who rush. "We can't stop here, this is ini file editing country!" There are a lot more clans in WoT compared to Squad. 100 times more? 1000 times more? I don't play WoT but I know that community of WoT is very big. Yeah, that's a very useful feature for proper people and tools like this one should be in bookmarks and speed dial of every clan leader, but for the most people it isn't needed. @Kalith, just found some time to check the game files with the UE4 viewer and it seems that it's not compatible with the 7.2 version of Squad, so I can't get to the map markers' files and view them nor export them into .TGA files. I suspect the easiest workaround then is to simply take screenshots containing all the markers. If you're still looking for those screenshots I can take them for you during the day?